The Atlantic Sturgeon, one of the most expensive fish in the world, has taken up a spot on the endangered species list. The once-plentiful population has taken a serious nosedive since humans began targeting them for caviar eggs. Gross. Just eat some chips and salsa, for crying out loud. The National Oceanic and Atmospheric Administration Fisheries Service listed the Chesapeake Bay, New York Bight, Carolina, and South Atlantic sturgeon populations as endangered, and the Gulf of Maine sturgeon to be threatened. Bad news? Yes, definitely. However, there is always the hope that this alarming declaration could lead to new levels of protection for the fish and their habitats along the east coast. Despite endangerment, some species of the American sturgeon that were declining have begun to make a comeback. 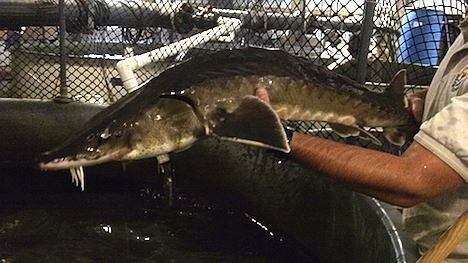 Over the past decade, the Tennessee Aquarium in Chattanooga reintroduced 115,000 lake sturgeon into the Cumberland and Tennessee rivers, where sturgeons had actually gone extinct in the 1970s. According to the aquarium’s director of conservation, Anna George, sturgeons are a unique fish species because they relate more closely to the lifes of humans than most fish species. No, not in the sense that they eat fast food and unnecessary amounts of sugar (see Should Sugar Be A Controlled Substance? New Report Says Yes), but sturgeon can actually live to be as old as 150, and they don’t reproduce until they’re teenagers. I wonder if they watch 16 & Pregnant, too?.